Recently a viewer emailed me about a shifting problem he was having with his 1969 Sportster. One of his questions was how to remove the transmission assembly without the specialty tool listed in the factory manual. 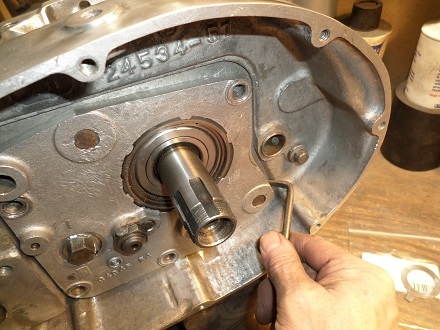 To remove an Ironhead transmission from the cases, you first have to remove the primary cover, then remove the clutch, primary chain, and gears. When the access door (trap door) is clear, remove the four bolts, then slowly and carefully, pry the access cover with a right-angle screwdriver or something similar. Loosen one spot a little, then loosen another spot opposite that one, etc. It will take a few minutes, but this method works without damaging anything. 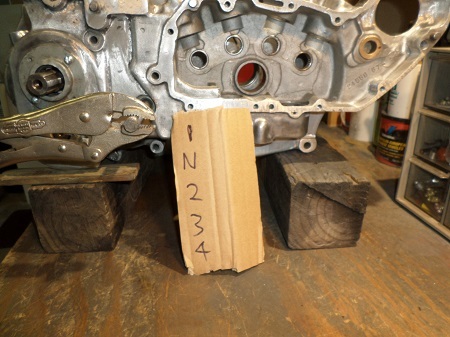 Avoid the temptation to smack the transmission mainshaft from the other side with a hammer. There are 23 small roller bearings at the other end of the mainshaft. Save yourself some grief and remove the transmission assembly slowly. These rollers will fall out as you pull the transmission out, so prop some rags around the motor and try not to lose any of them. Sometimes when removing, the countershaft will stay in the case and the rest will come out with the access door. Other times the gears on the countershaft will fall off when pulled out of the cases. Keep track of the thrust washers at the ends of both shafts. The mainshaft is the one on top and is longer. 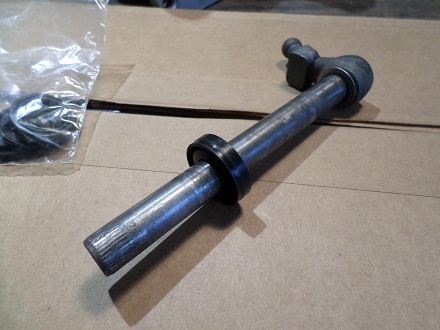 The countershaft is the one on the bottom and is shorter. 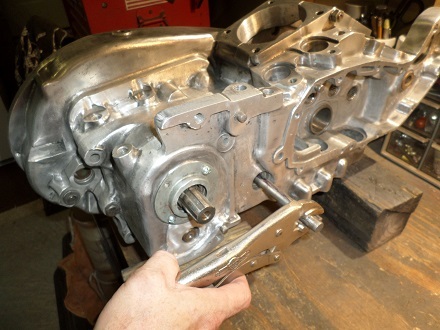 Since it may be weeks or even months before the transmission is re-installed, note the order that things come out so you can reassemble it correctly. Write things out in a notebook, or take pictures. If you mix up the transmission gears, remember this simple rule. 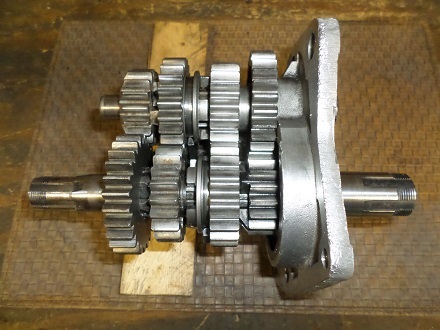 The mainshaft gears are installed "big-small-big-small", so countershaft gears will install "small-big-small-big". 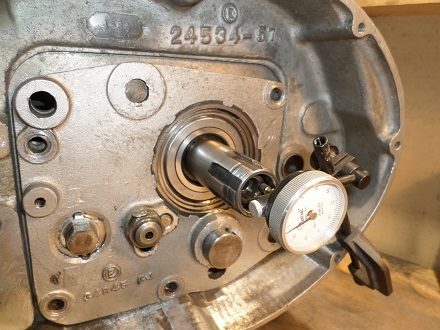 When installing the transmission assembly, the mainshaft and countershaft end play needs to be checked and adjusted. You'll need a dial indicator to correctly measure end play. Install and tighten the four bolts in the access cover. 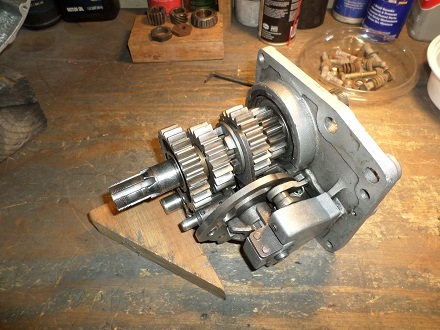 From the sprocket-side of the mainshaft, press the clutch gear in. Moving the mainshaft back and forth, measure the end play from the left side (trap door side). The factory manual states that mainshaft end play should be between .015"to .025". Mainshaft thrust washers are available in assorted sizes. With an old spoke or other suitable wire, push into the hole on end of countershaft (right side of engine). Measure end play with dial indicator while pushing and pulling countershaft. The factory manual recommends countershaft end play should be between .004"to .009". Countershaft thrust washers are available in assorted sizes. After the mainshaft and countershaft play are checked and corrected, it's time to install the shifter shaft. The shifter shaft is also referred to as the shift shaft, shift lever, inner gear shaft, or lever arm shaft. There are two kinds of shifter-shafts used on Ironheads. Early models (like the one shown) have smooth splines, and later Ironheads (1977-1985) have shaft ends that are splined. The two styles will interchange. To me, the early design seems to make more sense--if the bike fell on it's side, a splined shifter would break or bend. This would mean removing the primary cover, primary chain, gears, clutch, and transmission. A smooth shaft would merely be pushed up, which could loosened, spun back, and re-tightened. 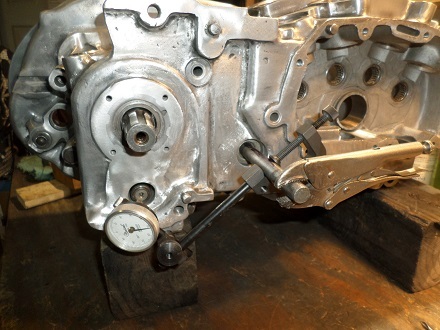 With the transmission assembly removed, install the shifter shaft into the right-side engine case. For proper shifting, the shift lever arm needs to be centered. Mark the shaft at the 12 o'clock position with a felt-tip marker so you can tell if the arm position changes when installing the transmission. Once the transmission is re-installed, check that the shifter shaft is correctly engaged with the shifter pawl. Grease the 23 roller bearings and install them back into the bearing race. 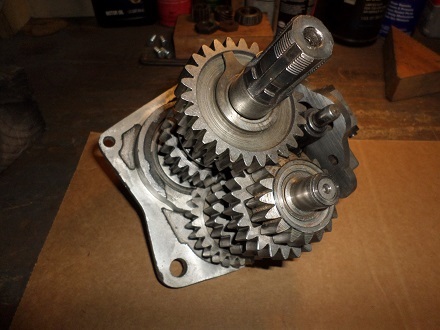 When done with re-assembly, check all four gears (including neutral) by shifting the transmission on the workbench. I go through the gears with a pair of Vice-grips attached to the shifter-shaft, or you could temporarily install the foot shift lever. You should feel a slight resistance and also hear a "clunk" when the gears engage.